“What did you DO to become a published children’s book author?” is a question I’ve often been asked. My stock answer is not unlike how many authors might respond. I’m a lifelong reader, particularly of children’s classics and literary fiction. I participate regularly in children’s writers workshops, study books on writer’s craft, attend author events, and take classes at the Loft literary center. I furthered my formal education by earning an MFA in creative writing degree from Hamline University. 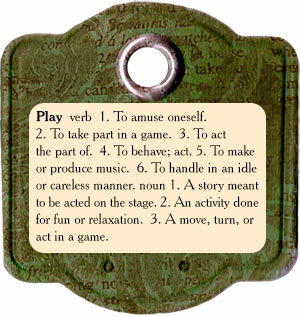 However, lately I’ve decided that I did something even more important: As a child, I played. Growing up in the 1950’s I played with dolls I named Ginny, Cindy, and Saucy. I cut out Betsy-Tacy paper dolls. I took stuffed dogs named Lady and Tramp on long walks, holding their red plastic leashes tightly in my small hand. I spent hours with a family with six children who lived in a tin, two-story dollhouse. And, it was through this act of playing that I practiced and learned the most valuable skill of all: I developed an imagination. I developed my innate ability to form stories in my mind, an ability to create. A year after I was born, the American Character Doll Company introduced Tiny Tears®, a rubber doll with a hard-plastic head and molded hair. Tiny Tears had a round face, blue eyes with thick lashes, a pinched button nose, and an open hole in her tiny red mouth. The diapered doll came in a box with a baby bottle, pacifier and bubble pipe. In addition to drinking, wetting, and blowing bubbles, Tiny Tears could cry real tears. No seven year-old girl was ever happier than I when Santa Claus left a ‘crybaby’ under our family’s Christmas tree. 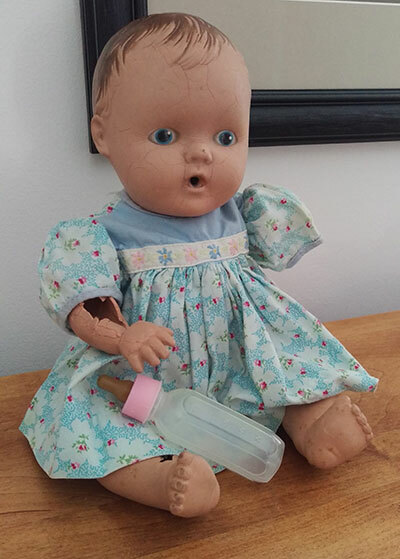 Tiny Tears was just one of my many dolls, carefully selected by my mother. My mother loved dolls; she kept her own until the end of her life. No doubt I will too. Tiny Tears wasn’t my first baby doll, but she and her predecessor, a cherub-like infant named Susie, were, and still are, my favorites. Like the hand-sewn, sentient sock monkeys in The Secrets of Eastcliff-by-the-Sea, my dolls were well-loved. Wear and tear from squishy hugs and frequent handling are evidence of that. Tiny Tears now has a break in her head and a fissure crack above her faded blue eyes. Her left arm is loose in its socket. Susie-Doll’s once soft and rubbery body feels like wood. Her right arm is crumbling, her left arm long gone. Meant to look like real human beings, these toys willingly assumed the endless variety of voices and personalities and roles that my young imagination assigned them. Eventually another baby doll came into my life, one I’d most likely seen in Wish Book, the Sears Roebuck annual Christmas catalog. At first glance, Baby-doll was perfect every way. 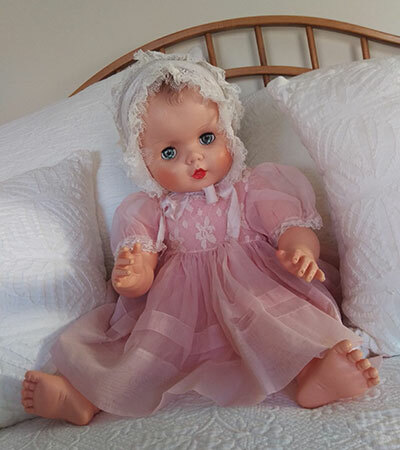 She had a pink bonnet, a ruffled pink party dress and pink slip and bloomers. In truth her perfectly formed plastic body was too large to carry, too hard to snuggle with, too cumbersome for quick and easy wardrobe changes. Her eyes seemed too blue and sparkly. She was a doll to be looked at, a doll who was difficult to love. A few weeks ago, the importance of play in the development of creativity was brought close to home when I spent a week in New Jersey with my granddaughter. Like all young children, her imagination is wild and fearless. The lines between the real and the imaginary are wonderfully blurred. She invites giraffes and dinosaurs to tea parties. She scrubs down Rody, a play riding pony, with a vegetable brush in the kitchen sink. She diapers Pippa, a stuffed rabbit, with paper towels. Luckily my daughter has changed her mind. 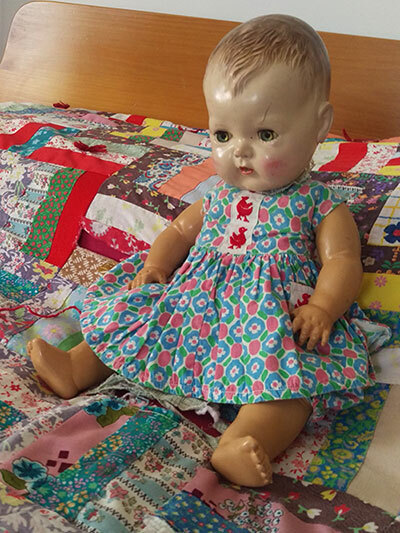 For my granddaughter’s third birthday in May, my present will be a custom-made Waldorf baby doll. My daughter found the doll maker on Etsy.com. 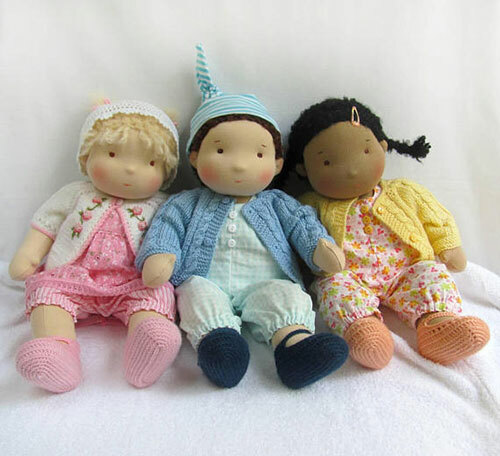 We co-selected our desired eye color, skin color, hair color and style, as well as the colors, fabrics, and yarns for the doll’s first outfit, making me a very happy grandmother. My own precious dolls and our endless hours of play left an indelible mark on my heart and memory. In ways both conscious and unconscious, our long-ago time together leaves its mark on the kinds of stories for children that I’m trying to tell.